FC Bayern of Pep Guardiola won another tiny friendly tournament – Audi Cup – after 2-1 win vs. Manchester City. 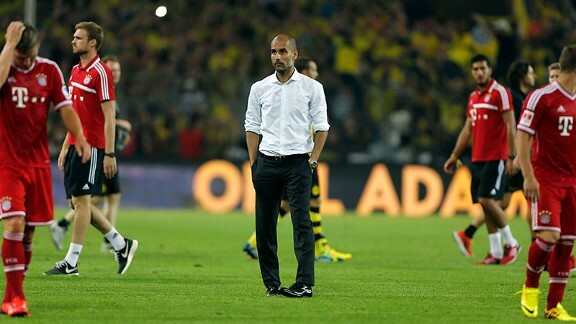 However, Pep still has everything to figure after losing out to arch-rival Borussia Dortmund 2-4 in the Super Cup. Bayern Munich’s new coach has had his motives criticised and questioned – moving captain Phillip Lahm to central midfield, No. 9 Mandzukic to the wing and signing Thiago to join an already crowded midfield. Would these movements disrupt a squad as finely tuned as Bayern’s? Monchengladbach of Lucien Favre is not the same title challenger like they were two years ago. Overachieving in Bundesliga is equivalent to seeing your best players leaving for bigger teams. Dante and Reus left last season, but that also means subsequent arrivals of exciting players – Alvaro Dominguez, Granit Xhaka and Luuk De Jong. However, with 2/3 of the squad under 25 years old, Lucien Favre is still in the process of building a quality side for Gladbach – brave enough to challenge for European football in near future. One cannot deny the overwhelming power Bayern Munich possesses at the moment. Our prediction sees Allianz Arena to be too big for Borrussia Monchengladbach to start the season with something. Another thrashing win for Bayern Munich is in the book. Would the new 4-1-4-1 formation movements disrupt Bayern’s triumphant 4-2-3-1 squad last season? Let us know! EDIT: The stats of FC Bayern and M’Gladbach was mixed up. We apologize for the mistake.